Jacorma is one of the last blossoming peonies of the season. Her big filled flowers, pink as chewing gum, are the centre of attention in every vase. Jacorma is a pretty peony with enormous flowers. 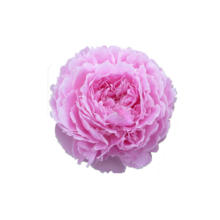 Like many big pink peonies, she must be cut a bit more ripe in order to open up. Jacorma is Dutch invention and not registered at the American Peony Society. Her name is an abbrevation of the Dutch names Jan, Cor and Marie. This flower is an example of fantastic Dutch craftsmanship: she’s a beauty.